California is a top cherry producing state, though cherries thrive only in areas such as Central Coast, San Joaquin Valley and Sierra Nevada foothill areas that meet minimum "winter chill" requirements. Home gardeners elsewhere can succeed growing tart and sweet cherries, though cherries are more challenging than most other fruit trees. A sunny, gentle slope that allows cold winter air to settle in nearby low spots can be ideal for growing cherries. Deep, sandy loam also is best, though cherries will grow in rocky or poor soils as long as there is adequate overall drainage. Most cherries require 1,000 hours of chill winter temperatures, hard to come by in Southern California. Prepare the soil at least one year before planting. Test the soil pH. Add any amendments as needed to achieve a slightly acidic soil, in the 6.2 to 6.8 range. Add sulfur in recommended amounts if the soil is too alkaline, or lime if it's too acidic. Add organic matter even if pH is ideal, spreading it to a thickness of 3 to 4 inches across the entire planting area. Cultivate deeply to mix soil thoroughly with all amendments. Plant cherry cultivars that do well in California, including tart or "pie cherry" trees such as Early Richmond, North Star, Meteor and Montmorency. Plant sweet or "eating cherry" cultivars only with compatible cross-pollinating trees; possible combinations for California include Bing, Black Tartarian and Early Burlat; Van and Bing; and Van and Royal Ann. Plant well-grown 1-year-old trees as early in spring as the ground can be worked. Dig a planting hole twice as wide as tree roots but no deeper. Place the tree in the center of the hole. Fill the hole 2/3 of the way with soil. Water thoroughly to settle that soil. Finish filling the hole and water again. Prune minimally at planting but enough to ensure that the trees are well-started in the modified leader style. Remove all branches that form narrow angles with the central leader. Cut back the central stem or leader to about 30 or 40 inches above ground to force lateral branches to develop. Provide regular care for young trees. Irrigate when weather warms and trees are growing, providing at least 5 to 10 gallons of water per week per tree--more in very hot weather. Spread mulch in a doughnut configuration, with the young tree at the center of the doughnut hole. Mulch to a depth of 4 inches within the tree's dripline, or the outer edge of its leaf canopy. Keep the mulch from touching the tree trunk. 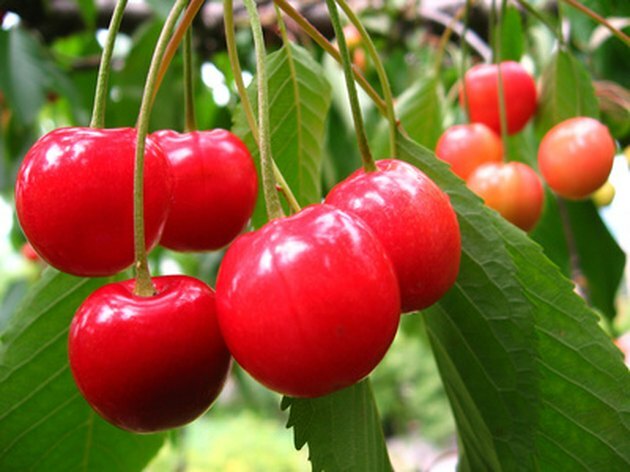 Continue training the cherries in the modified leader style--the preferred pruning approach for cherries--in early spring, when trees are dormant. Work to achieve strong scaffold branching all the way around the tree. Protect against spring frosts, which can damage blossoms and developing fruit. Cover backyard trees with polyethylene tarps on freezing nights--tie tarps down to prevent them from blowing off--and add heat. Place a kerosene lantern or electrical heater beneath the tarp, or hang a 60- to 100-watt light bulb inside the tree canopy as a supplementary heat source. Remove the tarp during the day. What Is the Root System of a Dogwood Tree?